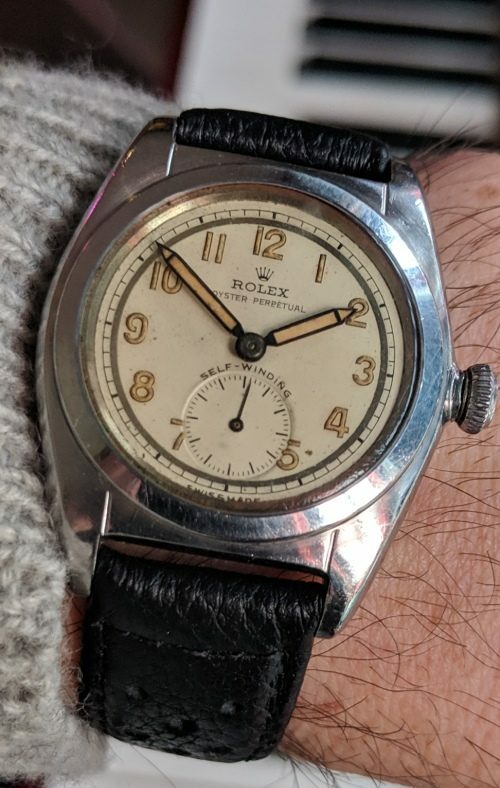 It is becoming VERY difficult to find all original and well-preserved examples of the Rolex Bubbleback. This 32mm. stainless steel version retains it original winding crown (which was not fully screwed down in my photo). The dial is a rare confuration with curved self-winding print above the sub-seconds. Notice the original Arabic luminous numerals and original blued steel pencil hands with original lume. The reflective track adds further interest as well. The case looks like it was barely ever polished. The automatic ROLEX bubbleback NA movement was just cleaned and is accurate. The bubbleback is seeing a resurgence (which it should). This is a prime original example for the collector-and can be worn daily.